Really beautiful outfit. THe colour combo is unique and the hijab is tied so interestingly. It's an almost Gulf-Emirati style. Well done! Absolutely love the way she ties her khimar. lovely color combination, and the sandals look cute and comfortable. I adore this outfit...the colors look amazing together. cute outift! 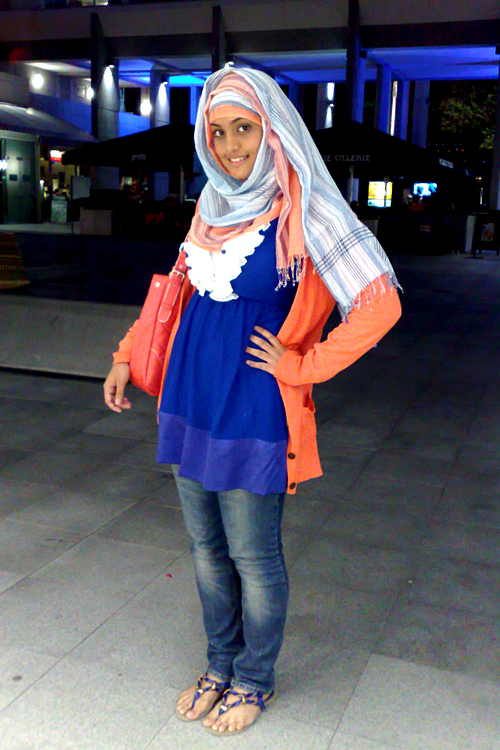 i have the same blue hijab :) H&M? love their scarves. i like the outfit, but i would have wrapped the hijab differently. it looks like it would b to hot, to much on ma head and face. I disagree with sugarmelon - although I definitely see where she is coming from - in the sense that I think this girl has achieved a great fusion look. It would have been all a bit too much if she was puffy all over with a maxi dress at the bottom. I love this look,it looks bright and vibrant and masha'Allah she looks lovely. That's HOT. I love the outfit, the girl is amazing looking and the colours are too good, they are viberant, confident and I think the choice in hijab and dress style is wonderful. Mash'allah she is beautiful. Love it, Love it, Love it. fabulous hijab-do! man, I mean how did this girl do her scarve!!! has anyone got any idea? seriously! I love, love, LOVE.. this style!